Every year thousands of non-biodegradable items end up in the worlds landfills. Waste studies that have been performed have shown that using clear garbage bags increases the diversion of food waste, recyclables and household hazardous wastes from landfills. Many garbage men face dangerous conditions during the collection of trash because of hidden items that they can not see. With clear garbage bags, collection workers can easily identify potential hazards, such as needles, broken glass and other sharp objects. In addition, the health of these workers is protected by avoiding contact with objects that could cause serious illness and disease. Many municipalities issue fines for hazardous items that should not be in the trash. Items, such as batteries, paint, solvents, light bulbs and other electronic or hazardous items can be more easily diverted to the appropriate waste management resource if they can be readily identified in clear garbage bags. Using clear bags for trash has clear advantages. However, it is still important that you maintain your privacy by ensuring that sensitive documents are shredded prior to disposal. For other personal items, you can always use a smaller opaque bag in the trash. In addition to all of the benefits presented here in terms of waste management, using clear garbage bags can also help your staff to think more carefully about the types of items that end up in the garbage. 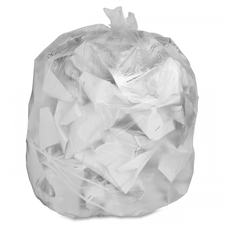 Using clear bags will encourage your staff to respond more appropriately to decisions about what to throw in the garbage and what should be recycled. 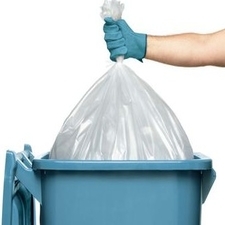 If you want to ensure that your business is in compliance with local waste management regulations, clear garbage bags can ensure that your business is up to standards.